Lenexa Therapist: Mary Sheridan - Therapist 66215. Send A Message To Mary. Mary B. Sheridan, Licensed Specialist Clinical Social Worker, has years of life experience assisting her when she is working to find just the right therapeutic tools for her clients. Each client is unique and deserves special attention. Mary enjoys the challenge of being able to quickly assess what the client may need and matches that to what the client wishes to accomplish. This usually saves time and we can get down to work right away. Mary has raised three children, been married for over 37 years, worked in the health field for many years, and now is enjoying helping people live their best life. Having cared for many family elders, she has experienced the challenges through many life spans and has great empathy for the many balls that people are juggling these days. Every generation has their own very valid challenges, and Mary enjoys working with young teens to older adults. She also enjoys helping couples with their relationship challenges. 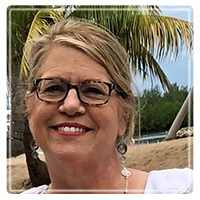 Using an eclectic approach of blending many therapeutic approaches, Mary utilizes cognitive behavior therapy, emotionally focused therapy, mindfulness, neurobiology, life coaching, and other modalities to find the best tools to help clients deal with their specific situation. No two approaches are the same. Everyone learns differently, and Mary listens carefully to how best to help resolve whatever issues each client is experiencing. It seems that with this technology-driven era we live in, that people’s minds are stressed more than ever. So many clients come in and discover that they have been practicing what we call ANTS, Automatic Negative Thinking. This leads to more depressed and anxious behaviors. Learning how to identify and conquer these ANTS with a few new skills, one can greatly enhance a client’s forward momentum in leading a much happier, more fulfilled, less worried life. Mary wishes everyone could come in for a life “tune-up” as so many people live unhappy lives without knowing there are some simple tools, easily learned, that can be life-changing in a very positive way! Mary holds a Bachelor’s of Science Degree in Chemistry/Biology and a Master’s Degree in Social Work. She is a member of the National Association of Social Workers (NASW). She has a private practice office in beautiful Lenexa, Kansas, centrally located. She has enjoyed providing therapy in her private practice for nearly ten years. Mary feels her many life experiences are the perfect background to providing compassionate, non-judging, comfortable, supportive therapy to those who are ready for positive change. Let's get started!